Tac-Bar is a ready to eat tactical food ration, the most compact and fortified with vitamins and minerals food ration available today. There is no other ready-to-eat food ration as fortified with what your body requires to survive and perform at its peak, whatever your mission. 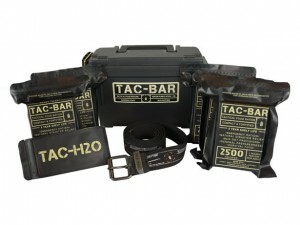 Tac-bar rations arrive neatly packed inside a heavy-duty molded-plastic storage box made from a rugged polypropylene with the Tac-Bar labeling fixed to the side panels. It was designed for strength and secure stackability in mind. The outer dimensions are 11.5″ x 5.25″ x 7.25″ leaving plenty of room inside for any gear stored inside. The box is also sealed with a durable rubber o-ring seal to keep the moisture out. A no-fail brass latch secures the lid preventing accidental opening, and the handle is designed to reliably carry a heavy box loaded with up to 15 pounds. The watertight storage box performs many functions… In the past, they used to ship rations individual, but they found that the bars and the mylar packaging would become damaged during transit. The storage box solved the problem. In addition to protecting the ration bars, it is also a watertight 3-liter basin perfect for treating and transporting water in an emergency. It can also be used as an ammo box or to store emergency gear in your car. Inside the storage box there are five individually wrapped 2500 calorie ration bars, a pouch with 10 Aquatab water purification tablets, and a 1.5″ black nylon webbed belt with Tac-Bar advertising on it. The belt is a nice touch to fill the extra space, preventing the ration bars from rattling around, but it is certainly not the finest belt that I have seen. I would have rather the box come with a bandana or shemaugh for pre-filtering the water when the case is being used as a water basin. In each of my kits, I decided to swap out the belts and pack them with as much gear as I could squeeze in. In addition to five Tac-Bars, I was able to fit a bandana so I could pre-filter water, two mylar blankets and a heavy-duty 55-gallon garbage bag for shelter, a couple quart and a gallon ziplock bags, a small pocket knife, a Bic lighter and a 100-foot bundle of #36 bank line so I could rig a shoulder strap if I ever needed to. I set the box up in this way so it could be used as a stand-alone grab-and-go bug-out solution. If one of my family members had to grab the box and run, they would have at least a minimal amount of gear with them to get them by for a week or so. Each Tac-Bar is vacuum-sealed in a custom heavy-duty four-layer 110 micron mylar pouch protecting the bars and providing a shelf-life of up to five years. Like most emergency rations, heat does not have near as much of an effect on them as it does for an MRE and canned foods, but it is always best to store in a cool, dark and dry location for best results. The pouches intentionally do not have any ez-open notches like many other products sealed in pouches. Field testing demonstrated that the rations faired much better when they did not have the notches, preventing accidental exposure of the bars to the elements. As a result, Expedition Research opted to not include them, instead relying on the notion that most people would have a knife or sharp object with them in a survival situation. Aquatab water purification tablets are easily the most popular water purification tablets on the market, and each Tac-Bar kit comes with a small pack of them in a waterproof resealable mylar pouch protecting them from moisture. They are effervescent tablets that kill microorganisms including cholera, typhoid, dysentery and other water-borne diseases leaving the water safe and ready to drink within 30 minutes. Each pack comes with 10 tablets which is enough to treat 10 liters of water. However, additional tablets can be purchased separately. Each TAC-H2O Refill pack includes 100 Aquatab water purification tablets. Tac-Bar rations are made from a unique combination of pure cane sugar, enriched wheat flour, vegetable shortening, corn syrup, pure honey, whey protein, oats and coconut, fortified with the recommended daily allowance of 15 vitamins and minerals in a ready-to-eat food ration with 2,500 calories to keep you at your best in an emergency situation. 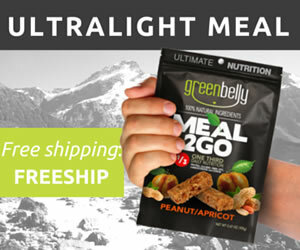 They have been engineered to provide a balance of calories, fats, carbohydrates, natural sugars and protein, exceeding all SOLAS, Transportation Canada, IMO, FAA and USCG requirements for lifesaving rations. Honey is one of the primary ingredients found in the Tac-Bar even though it is one of the more expensive ingredients. Besides tasting better, it is also a natural preservative and offers many health benefits over other sugars and sugar alternatives. Whey protein isolate is also one of the more expensive ingredients found in the Tac-Bar, but it offers much more protein per gram than cheaper protein alternatives. Not only is Vitamin C (citric acid) one of the many important vitamins provided in the Tac-Bar, it is also used to lower the PH level of the food bar which helps prolong shelf life and stability. Rather than fighting the naturally tart taste of Vitamin C, the decided to add natural lemon extract to further enhance the citrus flavor. Furthermore, citric acid is also used by athletes to activate the saliva glands in mouth making them less thirst provoking than other options. Each Tac-Bar comes with two score marks to ease in splitting them into three equal 840 calorie portions. Once opened, the Tac-Bar must be consumed within about five days as it will spoil. A resealable closure would be a welcome addition to the pouch to keeping the leftover portions fresher longer and any crumbs in the pouch. I also found it best cut each portion into smaller pieces to prevent them from crumbling making them easier to consume. The nutrition information printed on the label is based on one serving, or one-third of the ration bar. 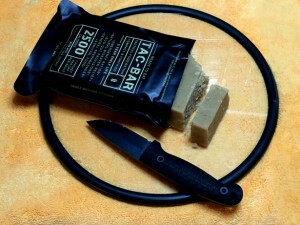 Tac-Bars can also be dissolved in boiling water, stirring occasionally until it has an oatmeal-like consistency. This is perfect for those who cannot chew the ration itself. However, it must be eaten within 12 hours. Since Tac-Bars are ready to eat rations and heat does not bother them near as much as other rations, they are perfect for storing in a car, boat or cabin, and even in your EDC. Not many other food storage options are capable of withstanding the heat of a closed vehicle, and require no preparation whatsoever. It is also important to remember that these are emergency rations and not healthy fruit bars. They have one purpose… To provide all of the nutrition and energy necessary to help you thrive in an active survival situation. I really enjoyed trying out the Tac-Bar… I could easily live off of them for a few weeks if I found myself in a survival situation. However, I would certainly prefer to have a variety of other rations available as well. It has a pleasant taste, texture and aroma that was not hard and dry like many of the other emergency rations that I’ve tried. You can clearly taste the oats and feel them on your tongue as you chew, and the lemon flavor is unmistakable. But not so strong that it the bar is tart or overbearing in any way. I guess that it helps that I’m a big fan of the lemon flavor anyway. The Tac-Bar is certainly not the cheapest food ration on the market, but it is made in America entirely from quality ingredients and it is not really that much more expensive per calorie plus you get a nice storage box with it. I was very impressed with its great taste… Even my son liked it, and so did my lab pup… She stole a large chunk of it that I had laying on my desk and ate every crumb while I was enjoying it myself. 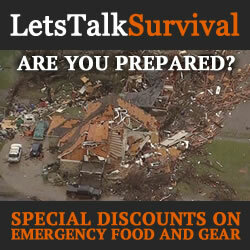 Every food storage cache should have some emergency rations in it so if you happen to be in the market for them, the Tac-Bar is definitely one that I would strongly consider. Two thumbs up! Expedition Research is a small company consisting of a husband and wife team so they take great care with every aspect of their business. 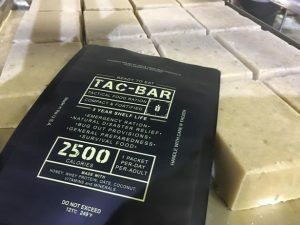 The owner, Aaron Pufal, came up with the idea for the Tac-Bar because all the ready to eat rations were made for lifeboats and they didn’t have any real nutrients in them so they were not well designed for preppers and for tactical use. As a result, the Tac-Bar was born. To keep costs down, Expedition Research hires food scientists as needed and food production is performed in an FDA approved facility located in Florida. Aaron personally supervises every step of the process.